Note : Last updated on 17th April 2013. 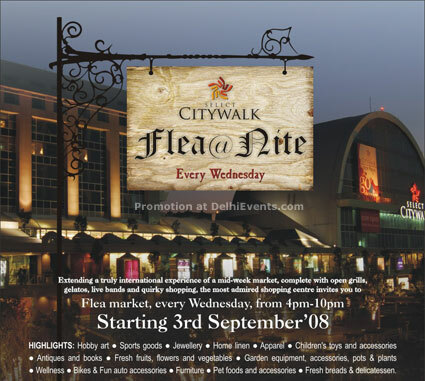 Event Description : Select CITYWALK, recently awarded the “Most Admired Shopping Centre” award (by ICSC) is coming up with Flea Market every Wednesday. The Flea by Nite market is positioned strategically as a mid week frenzy which will be a family getaway to shop and enjoy the beauty of outdoors in a very pleasant ambience. Some of the highlights of the Flea @ Nite market are : quirky shopping, live music , grills & gelatos, juice & mocktail bars, cafes, street art – charcoals & caricatures. Furniture - Pet foods & accessories - Fresh breads & delicatessen. On an average weekday, Select Citywalk is visited by more than 17,000 discerning shoppers, so we are expecting a huge turnout for the event as well. The invites for the same will be sent to all high commissions amongst other regular shoppers. how do we register to participate as a seller in the flea market? How do we register as a seller in the flea market ?